The students were asked to read material on 3 websites, one of which was a Holocaust denial website, and then write an essay, giving their opinion on what they had learned from these three websites. According to a news story, which I read yesterday, none of the 2,200 students, whose papers have been graded so far, came to the conclusion that the Holocaust was a hoax. If you read the diary of Anne Frank and come away from the experience willing to entertain the notion that this whole Holocaust thing might have been a hoax, you didn’t read it very carefully. The photo, that is shown above the article, is a poor choice, in my humble opinion, because it is a photo that disproves the Holocaust. The photo shows Hungarian Jews who have just arrived at Auschwitz, where they were given a shower and a haircut before being admitted into the camp. 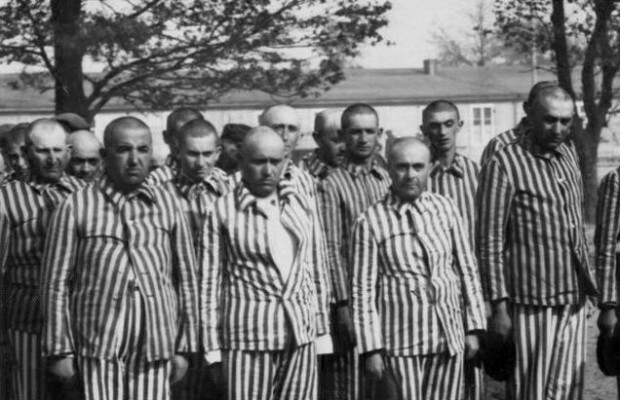 These men are obviously over the age of 45, and should have been sent to the gas chamber, according to Holocaust lore. The reason that Anne Frank’s family decided to go into hiding was because Anne’s sister Margo had received a notice that she should report for an assignment to work in a labor camp. I knew what this meant because I had read a book called The Nazi Officer’s Wife. In the book, the girl who later became a Nazi Officer’s wife, told about how she was treated well, given plenty of food, and allowed to return home after two years in the work camp. Amazingly, she was even allowed to visit a nearby town on weekends and she was allowed to send food home to her family. It was not just Jews, who were sent to these labor camps. During the Nazi years, every German boy and girl had to work, for no pay, in a labor camp for two years. Because the Franks had gone into hiding, they were treated worse than they would have been treated, had they not gone into hiding. The story of Anne Frank and her family constitutes “Holocaust denial.” As every student of the Holocaust knows, prisoners over the age of 45, who were sent to Auschwitz, ended up in the gas chamber, after going through a selection, and being waved to the left by Dr. Mengele, the “Angel of Death.” Anne’s father was 56 years old, when he arrived at Auschwitz, yet he was not sent immediately to the gas chamber, but was selected to work. After a few months of working at Auschwitz, Otto Frank, who had previously never worked a day in his life, decided that heavy labor was not for him. He got a Jewish doctor in the camp to put him into the camp hospital, where he remained until the camp was liberated by the Soviet Union. Anne Frank was over the age of 15 when she arrived at Auschwitz, so she was able to pass the selection and was not sent immediately to the gas chamber. However, she soon became sick and couldn’t work, so she was sent to Bergen-Belsen, the EXCHANGE camp in Germany. The train that took her to Bergen-Belsen was a train loaded with sick prisoners, which was monitored by the Red Cross. If Anne had not gone into hiding, along with her family, she would have eventually been sent to the Star camp at Bergen-Belsen, where she would have been treated very well. Her school friends, who did not go into hiding, were sent to the Star Camp, where they survived, and then went to Israel after the war.